The Cave of the Lakes. Kastria Kalavryta, Achaia, Greece. Photo: Joel Skidmore. Achaia (a-KEE-a). Region of Greece. The name goes back to the Heroic Age, as do the local legends. It was in Achaia's "Cave of the Lakes" that the daughters of the king of Tiryns took refuge when driven mad by the goddess Hera. They had been roaming the countryside thinking they were cows when the seer Melampus cured them of their mania. 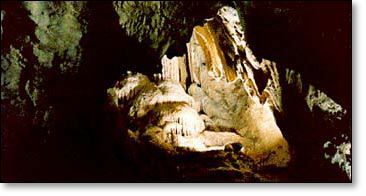 It was only in 1964 that the people of Kastria discovered the inner recess of the cave, which is unique for its string of cascading pools.